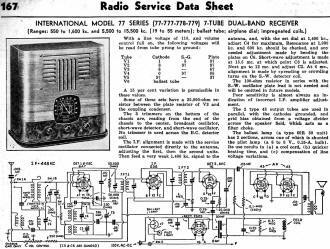 Seeing a photo of the International Model 77 'Kadette' radio reminds me of the exaggeratedly large heads of invaders in alien attack sci-fi flicks. It has to do with the small dial buried amongst the relatively large cabinet. ...but that's just me. I'm sure it was a fine radio. 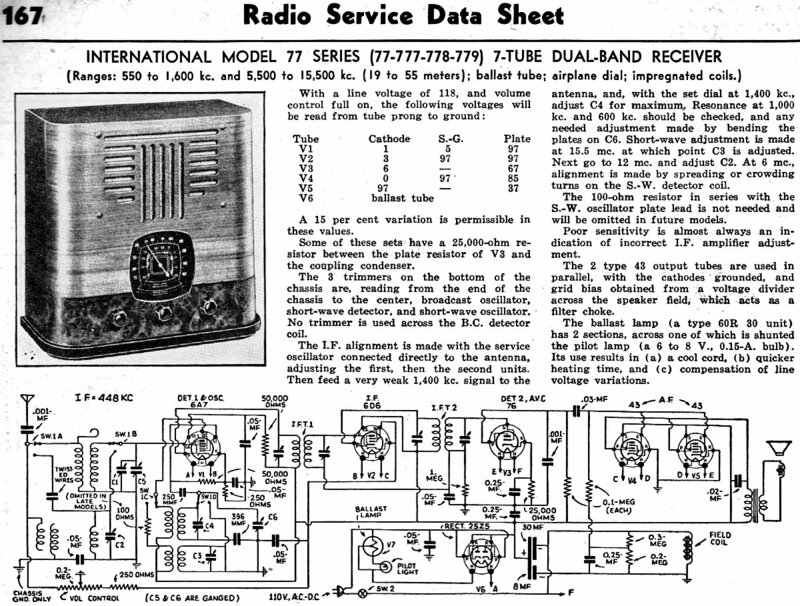 The thumbnail image of the International Model 77 'Kadette' radio is from the RadioMuseum.org website. 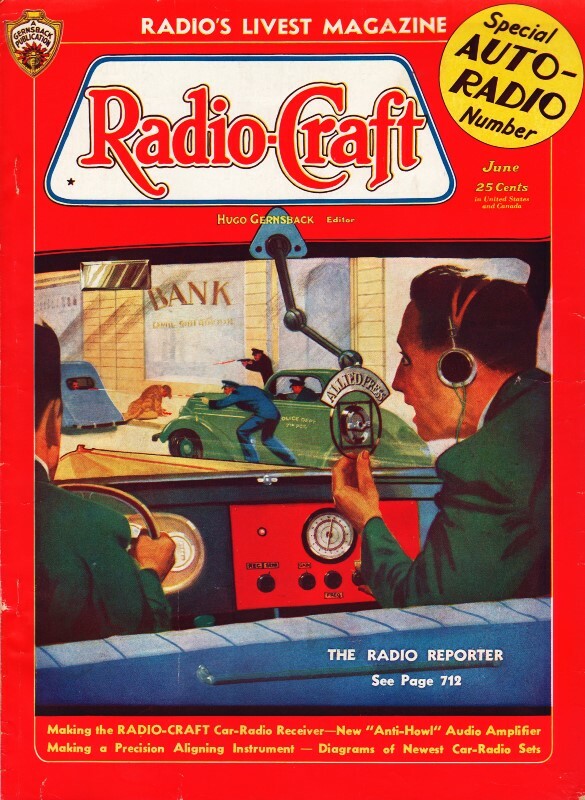 Below is the Radio Service Data Sheet as it appeared in a 1936 issue of Radio-Craft magazine. Ranges: 550 to 1,600 kc, and 5,500 to 15,500 kc. (19 to 55 meters); ballast tube; airplane dial; impregnated coils. A 15 per cent variation is permissible in these values. Some of these sets have a 25,000-ohm resistor between the plate resistor of V3 and the coupling condenser. The 3 trimmers on the bottom of the chassis are, reading from the end of the chassis to the center, broadcast oscillator, short-wave detector, and short-wave oscillator. No trimmer is used across the B.C. detector coil. The I.F. alignment is made with the service oscillator connected directly to the antenna, adjusting the first, then the second units. Then feed a very weak 1,400 kc, signal to the antenna, and, with the set dial at 1,400 kc., adjust C4 for maximum" Resonance at 1,000 kc, and 600 kc. should be checked, and any needed adjustment made by bending the plates on C6. Short-wave adjustment is made at 15.5 me, at which point C3 is adjusted. Next go to 12 me. and adjust C2. At 6 mc., alignment is made by spreading or crowding turns on the S.W. detector coil.